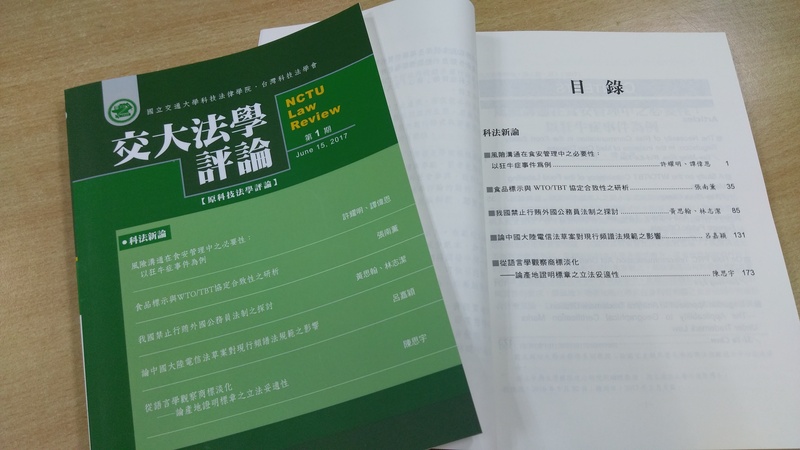 NCTU Law Review endorses the ideals of internationalization of jurisprudence, empirical studies of law, and interdisciplinary integration. This journal encourages innovative legal studies, believing that jurisprudence should reflect social realities as well as pursue fairness and justice. This journal also aims to serve as a platform of interdisciplinary dialogues. Intellectual Property and Knowledge Entrepreneurship, Corporate Crime and Financial Criminal Law, International Trade Law, Social Justice, Gender Equality and Labor Rights, Biotechnology and Medical Law, Telecommunication and E-commerce Law, Fundamental Law, Professional Ethics, Legal Education, Arbitration and Mediation, Litigation, Non-litigation and Law Enforcement.